In a new weekly feature here on LakerStats, we’re going to do a recap of what went on the last week of Lakers basketball, from player stats, to trends, to items of note. Basically whatever tickles our fancy to talk about. And we’re calling it “The Jigglin’ Jello” because…well…I don’t know, it sounded good, and was the first thing that came to mind…OK? It will either be written on Sunday nights or Mondays, depending on how tired this author is. So here is the first installment, for the games of December 5-12. Enjoy, and feel free to actually comment. We like comments, at least we know someone is reading something we post. The Lakers didn’t exactly knock off any heavyweights last week, so no win really stands out as that impressive. So in terms of the three wins they had, they played their best in the Washington game on December 7. And while they gave up much of a third quarter 19-point lead, they never fell behind like they did to both the Clippers and New Jersey. Like I said, there really were no great wins to talk about. Derek Fisher’s buzzer-beater was exciting of course, but again a game that shouldn’t have been that close. Pretty easy here, it was Kobe. Yes Derek Fisher hit the game-winner against the Clippers, but it was Kobe who hit two big shots down the stretch when the game seemed out of reach. He also was the one of the few Lakers who came to play against New Jersey on Sunday, and really willed the team to victory with some smart plays down the stretch of that game, as well as scoring 14 points in the fourth quarter. For the week, he averaged 27.8 points, 5.0 assists, 3.3 rebounds, 2.5 steals, and shot 48.8% from the field (39-80). It appears he’s getting his shooting rhythm back, even though he has had some issues at the foul line the last four or five games. Also a pretty easy choice here, it’s Ron Artest. What is going on with Ron’s offense? Defensively there’s little to argue about, he made great plays at the end of the Clippers game and averaged almost 3.0 steals for the week, but offensively? Ouch. How about this? He hit only 7-31 shots from the floor, that’s 22.5%, and you don’t need to know much about basketball to know that’s just plain awful. He was even worse from the three-point line, hitting 1-10. He did make 3-4 foul shots, and is shooting 73.1% for the season there, so that’s OK. And I’m not picking on Ron Ron, I love the guy, but right now his ineptness on offense is a bit of a liability. He needs to be able to give the Lakers more than the 4.5 points he averaged last week. He’s far too good of a player for those kinds of numbers. In a very up and down 10 games, the Lakers’ defense has improved. Last week they allowed just 93.5 points per game, and if you take away the Washington game, no team shot more than 41.3% from the floor. They’ve been good defending the three for most of the year, and despite a few issues last week, they did a decent job from there as well. They certainly aren’t playing championship-caliber defense, but they have clamped it down a bit more in the last week. The offense. What happened to the team that was averaging 112 points the first 15 or so games? They’ve only broken 100 twice in the last nine games, once was last week against the Wizards. They only averaged 96.3 points for the week, and that’s with a 115-point night against Washington. The main problem I see is that the three-point shot just isn’t going in like it was early on in the season. For the week, the Lakers shot just 32.9% (24-73) from beyond the arc. And without that reliable outside shooting, and with Pau Gasol just worn out up front from playing so many minutes, it has made life tougher offensively. Especially in the last two games, the Lakers have had good looks from distance, they’re just not making them. It really hurt them in the Chicago game. The Lakers continue their road trip all week with games in Washington, Indiana, Philadelphia, and Toronto. They also expect Andrew Bynum back Tuesday against Washington, and any minutes he can give them up front will be welcomed, for sure by Pau Gasol. All these games are winnable, and frankly they should win them all. But with the way things have been so up and down, it’s so hard to know what Laker team will show up. But the only team playing halfway decent in that group is Indiana, and they’re not exactly the Boston Celtics even at their best. 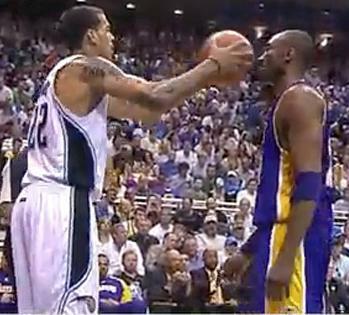 When reading about Matt Barnes, you often find the terms “defense”, “toughness”, and “outside shooting”. He describes himself as a football player playing basketball. After playing at UCLA, he was drafted by Memphis in a pick from Orlando, then his rights were traded to Cleveland. I don’t find that at all confusing. Really. The Lakers will be his 8th team in his 8th season in the pros. This 6’7″ 30 year old small forward will primarily serve as back-up to Ron Artest, although he could also get some spot minutes at shooting guard. Like the signing of Theo Ratliff, Matt Barnes will be able to provide some defense off the bench. Barnes averaged 9 points and 5.5 rebounds in 81 games last year. He was arrested September 8th on charges of felony domestic violence and for preventing his fiancee Gloria Govan from talking to 911 operators. He posted a $50,000 bail and was released. Govan made a statement a few days after his arrest saying that the charges are false. Sacramento County prosecutors will decide October 18 whether they will press charges. It is possible that the league or team may decide to suspend him for a couple of games, even if no charges are filed. Although that would make me question the presumption of innocence that is supposedly the foundation of our legal system. Fortunately, the Lakers have experience dealing with legal troubles during the season, and should be able to maintain focus. And small forward is a position where the Lakers have depth. Barnes said all the right things in his press conference, that he was happy to be with the Lakers and it was a dream come true. He is hungry for a championship and will contribute coming off the bench in whatever capacity the team says is necessary. Having veterans on the time still looking for their first ring is a good safeguard against complacency setting in. I consider this free agent acquisition a major upgrade, and one of the reasons the bench is much better than it was last season. Lakers Three-Peat! Back-To-Back! Lakers Rally, Beat Celtics In 7 For 16th Title! It wasn’t pretty, but it couldn’t have felt sweeter, as the Los Angeles Lakers won their 16th NBA Championship (2nd straight) 83-79 over the Boston Celtics Thursday night at the Staples Center, in a thrilling Game 7. The Lakers, pushed to the brink of elimination just two days earlier, rallied from a 13-point second half deficit in Game 7, led by the hard-nosed play of Pau Gasol who scored 19 points and grabbed 18 rebounds, and Ron Artest who put in 20 points and recorded 5 steals. Kobe Bryant struggled shooting the ball all night, going 6-24 from the field, but still managed to score 23 points and grab 15 rebounds. His 17-footer with just over five minutes left in the fourth quarter put the Lakers up 68-64, as they held on down the stretch for the win. Bryant was named the series MVP, averaging 28.6 points, 8 rebounds, and 3.9 assists, his second straight Finals MVP award, and his fifth title. The game was ragged all night, with both teams struggling to find any rhythm offensively, as it seemed everyone was feeling the pressure of a seventh game. The Celtics built a 49-36 lead late in the third quarter before the Lakers chipped away and got it to 64-61 midway through the fourth, when Derek Fisher hit a high-arcing 3-pointer to tie the game. That play seemed to breath life into the Lakers as they took the lead on two Kobe Bryant free throws and never looked back. The title was Fisher’s fifth as well, as he once again showed his big game heroics. Phil Jackson, who may retire this offseason, won his 11th title as a coach, putting him now two ahead of Red Auerbach all-time. His teams are now an amazing 48-0 when winning the first game of any series. The win marked the first time the Lakers have beaten the Celtics in a Game 7, they previously were 0-4 in such situations against the men in green. The Lakers franchise now sits just one title behind Boston (17-16) for the most all-time. Before the 80’s, the lead was 13-6 in favor of the Celtics. With the core of the team returning next season, there is no reason why the Lakers can’t get their first 3-peat since 2000-2002. But for now, all is right with the world, the Lakers are champs….again!! 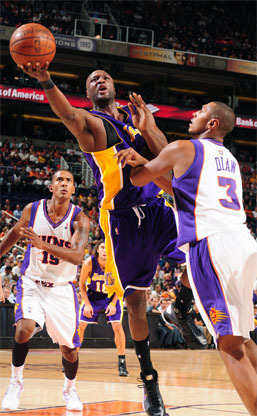 Lakers Run By Shaq and Suns! It was close for the first half, but the Lakers’ bench flexed their muscle and dominated the second, beating the Phoenix Suns easily 105-92 in Phoenix on Thursday. Kobe Bryant led all scorers with 24 points, but shot only 8-23 from the field. That was no matter, as the Lakers’ bench piled up 43 points and were led by Lamar Odom‘s 13 points, Jordan Farmar‘s 11, and Trevor Ariza‘s 10. The Lakers led 50-44 at the half, but turned up the defensive intensity in the second half. They led by as many as 18 points and cruised to the victory. The Suns shot only 44.2% from the floor, and committed 15 turnovers, to the Lakers 7. Former Laker, Shaquille O’Neal, had a solid game, scoring 15 points and grabbing nine rebounds, but he didn’t get much help. Amare Stoudemire led the Suns with 21 points, but missed several lay-ups and was mostly relegated to being a spot-up jump shooter. There were few remnants of the Suns’ former quick-strike offense, as new coach Terry Porter has insisted the team pound the ball into Shaq first. As a result, Steve Nash, who looks very pedestrian in this new offense, scored just 8 points, none until the middle of third quarter. The Lakers play host to Denver on Friday, as part of a back-to-back. It will be the first chance to see the Nuggets with Chauncey Billups running the point.